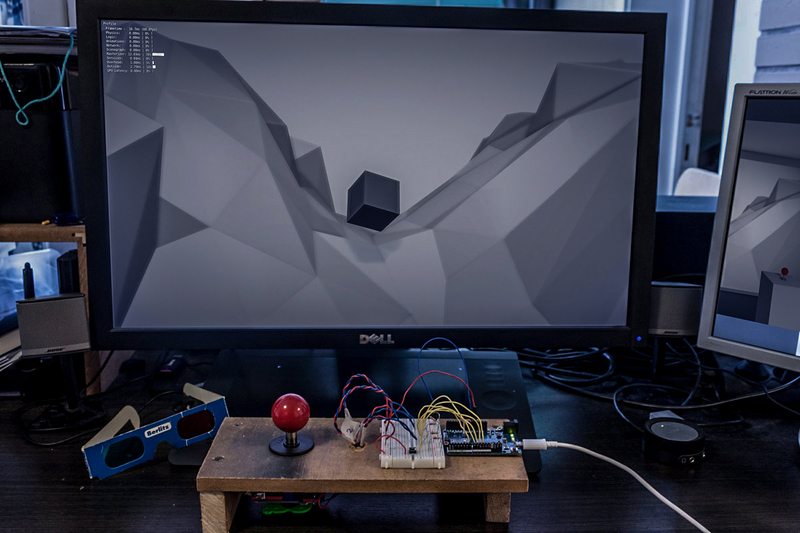 We've got two fairly simple interactive works that are controlled by a classic arcade joystick and a few buttons (via an Arduino microcontroller). Both works are made with the Game Engine of the software Blender3D, while there is an interactive 'play' element, they both lack goals, scores and all of the stuff by which most would define games. Hence we see them more in the context of our favoritism for looping imagery. As painters we love to dwell around in still pictures that have seized a moment in time and space, presenting us a unique perspective or interpretation. Sometimes video's, films or other moving pieces succeed in that same experience by either keeping a constant mood, or simply by adding a looping element: e.g. Peter Fischli & David Weiss film "Der Lauf Der Dinge". Think tableaux vivants such as 'The Greeting' by Bill Viola . But also the phenomenon GIF (those small moving, looping images, mostly known in the shape of dancing smileys.) For more about GIF as an art-form try this overview by Paddy Johnson on Artnet News: A Brief History of Animated GIF Art. 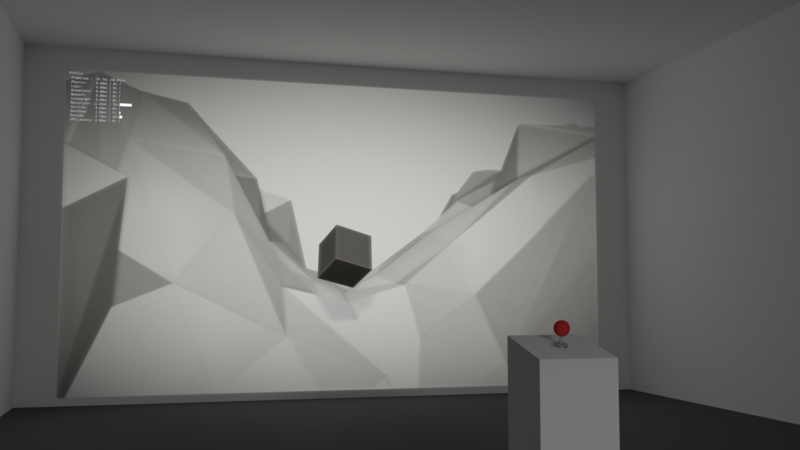 The first piece "The cube" shows a monolithic cube that rolls and stumbles purposeless through an endless valley. As a viewer you get some input to the cubes movement through the scene. Not unintended is the reference to Stanley Kubrick's A Space Odyssey 2012. The endless landscape evolves never satisfying the desire to reach the horizon. Humans evolved into tool-using beings who at a point in time found the time to culturally create the idea to wander through landscapes, going about and asking existential questions. That in short is "The cube". 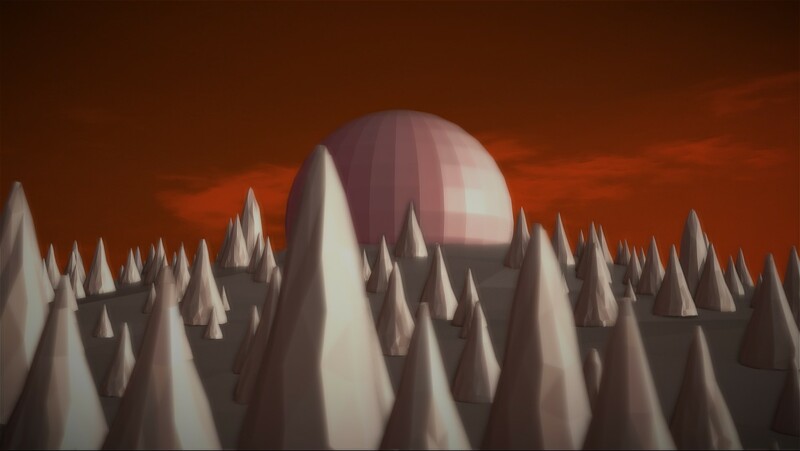 The second piece "Breathing scape", builds upon the same theme, this time the landscape is a hill with tree-like objects surrounding a huge sphere. The landscape slowly breathes, as a user you can make the hill take a deeper breath. Again the users (viewers) input is small; yet intended to show that however small the action, you do have an impact, or do you ;-) ? Both works are created in the so called low-poly style. In the digital world 3D items are build using geometric shapes, polygons (squares, circles, etc ...). Normally one would go through a lot of efforts to come to a point where you use as many polygons as a machine can compute. This will give smoother shapes, more details. And it'll eventually reach the state where the digitally 3D created images transcends to a point of believable, natural and realistic. But as it was never our goal to reach that state, we embraced the shortcomings of the technique and exploit them. To create the mood or story we're after we don't need realism, even more as we low-poly the shapes, we shift to the fundamentals of the idea's shown in these works in a very basic, low-poly, way.